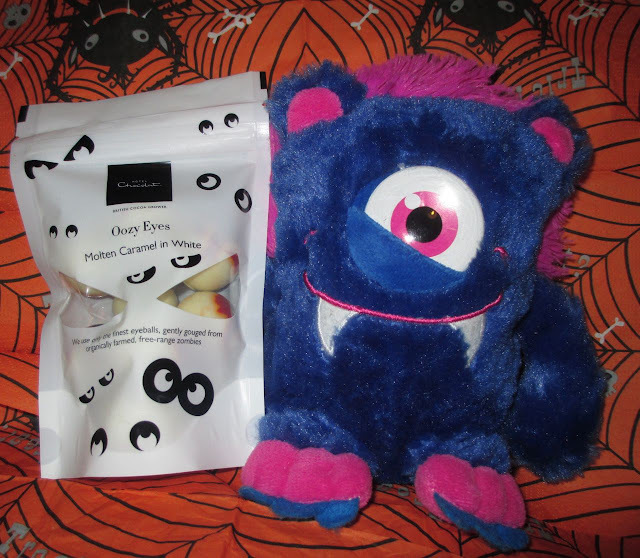 Cinabar was a little apprehensive about buying me these Oozy Eyes from Hotel Chocolat after my visible heaving incident one Halloween, when I tried to eat something like blood filled bug sweets. They tasted great, but it was the concept that stopped me from eating anymore of them. I've even eaten the same thing since, but not in a bug format and been absolutely fine! So… Oozy Eyes! no chance of barfing here then!? 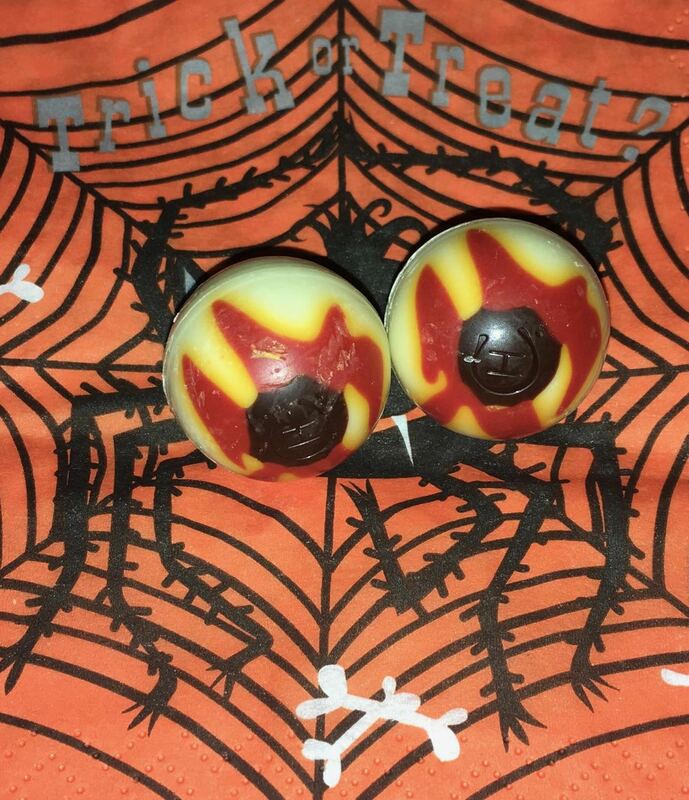 These Oozy Eyes are Molten (or runny) salted caramel in white chocolate spherical eyes. The packet mentions; "we only use the finest eyeballs, gently gouged from organically farmed, free-range zombies." I tried to weakly laugh when Cinabar mentioned that when passing me the packet, but my stomach overturned a little and I had to put the packet away for a while. I know… I'm a wuss! I tried not to think of the scene in Indianna Jones and the Temple of Doom when the leading lady is served sheep's eyeball soup. In fact just desperately trying not to concentrate on the concept and rather the taste, I popped an eyeball into my mouth. 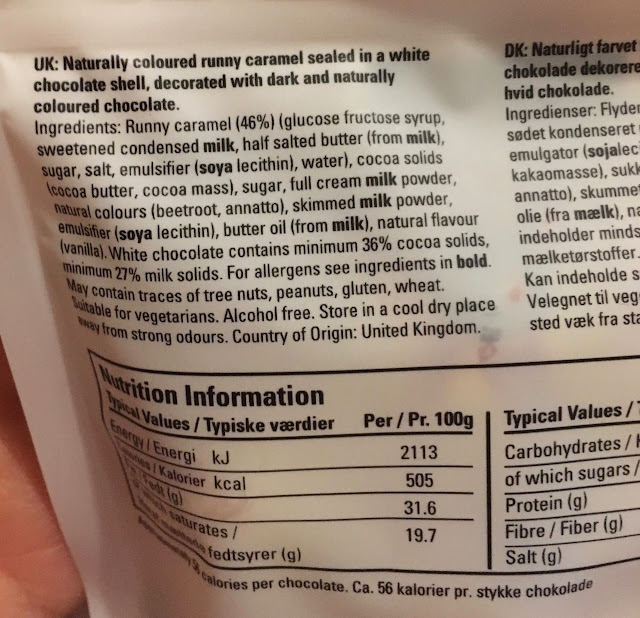 There was a hint of dark chocolate from the decoration on the front of the sealed white chocolate shell, then in one crunchy bite and following creamy chewing I was blasted with an oozing salted caramel flavour mixed with the favoured Hotel Chocolat white chocolate. Yum… So, if you like freaky concepts and aren't too squeamish, or just like white chocolate filled with runny salted caramel these creepy Oozy Eyes are definitely for you! The 105g packet has approximately 56 calories per chocolate eyeball, with roughly 15g of fat, 20g of sugar, and 0.31g of salt. Please see photograph for ingredients.